You may have encountered an arbitration clause in a contract and wondered what it is and whether you should be happy or upset about this clause. Or a colleague may have suggested to you that you include an arbitration clause in a contract, and you are wondering why this would benefit you. Arbitration as a process is very different from the process of litigation (trying cases in court), for business. You are probably familiar with the litigation process, but you may not be familiar with arbitration. Litigation is a very old process that involves determining issues through a court, with a judge or jury. In this case, we're talking about civil litigation - disputes between two parties (as opposed to criminal litigation, which involves the people against a law-breaker). Arbitration, on the other hand, involves two parties in a dispute who agree to work with a disinterested third party in an attempt to resolve the dispute. In arbitration, there may be one or more arbitrators who hear both sides of the issue and who make a decision. The arbitration process is private, between the two parties and informal, while litigation is a formal process conducted in a public courtroom. The arbitration process is fairly quick. Once an arbitrator is selected, the case can be heard immediately. In a civil litigation, on the other hand, a case must wait until the court has time to hear it; this can mean many months, even years before the case is heard. The costs for the arbitration process are limited to the fee of the arbitrator(depending on the size of the claim, expertise of the arbitrator, and expenses), and attorney fees. 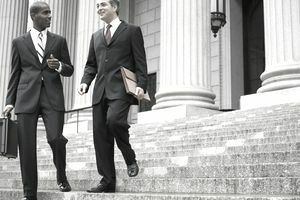 Costs for litigation include attorney fees and court costs, which can be very high. The parties in the arbitration process decide jointly on the arbitrator; in a litigation, the judge is appointed, and the parties have little or no say in the selection. The parties may have some say in whether a case is heard by a judge or a jury. Attorneys may represent the parties in an arbitration, but their role is limited; in civil litigation, attorneys spend much time gathering evidence, making motions, and presenting their cases; attorney costs in a litigation can be very high. The arbitration process has a limited evidence process, and the arbitrator controls what evidence is allowed, while litigation requires full disclosure of evidence to both parties. The rules of evidence do not apply in arbitration, so there are no subpoenas, no interrogatories, no discovery process. In binding arbitration, the parties usually have no appeal option, unless an appeal has been included in an arbitration clause. Some arbitration decisions may be reviewed by a judge and may be vacated (removed) if you can prove that the arbitrator was biased. Litigation allows multiple appeals at various levels. What if You Don't Have a Choice? Most contracts assume that any disagreements will be dealt with in the litigation process. The contract will list the jurisdiction in which the case is to be heard. Many contracts in the 21st century have a mandatory arbitration clause, which states that all disputes must be handled by arbitration. In most of these contracts, litigation is specifically ruled out as a possibility. Arbitration clauses are common in real estate (landlord/tenant) contracts and in employment disputes. Some contracts which include mandatory arbitration also include a provision denying the right to form a class action lawsuit.